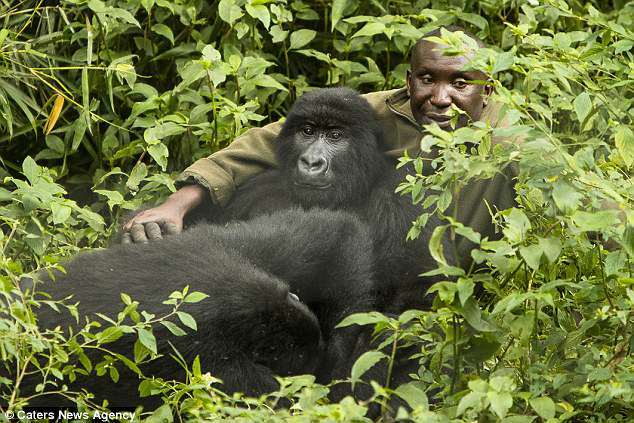 A photographer, James Gifford, caught the moment zookeeper André Bauma, who works at Virunga National Park in the Democratic Republic of Congo, was cuddled by affectionate gorilla. 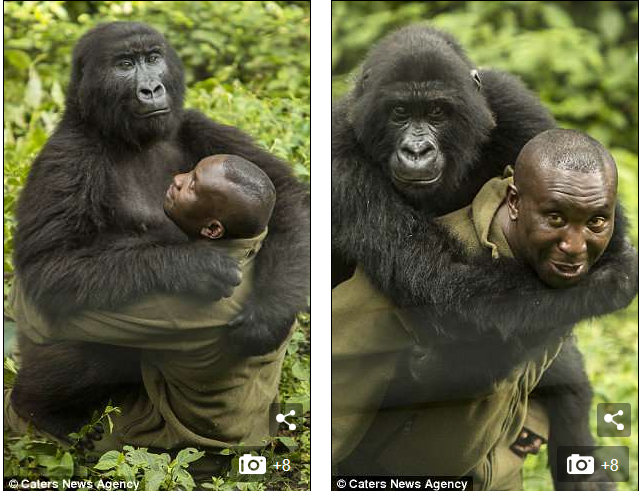 The photographer, who lives in Botswana, was astounded by the gorillas – especially when one even jumped up for a piggy back ride. 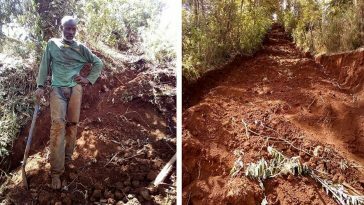 James, from the UK, said: ‘This was the first time I can remember when I’ve found myself so amazed and touched by what I was seeing that I found myself lowering my camera so I could properly concentrate on the interaction between André and the mountain gorillas. 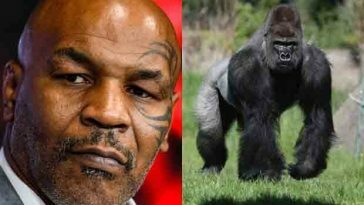 ‘The two female gorillas were orphaned after rebel forces killed nine critically endangered mountain gorillas in 2007, and the young babies were subsequently brought up by André. ‘André spent time grooming and communicating with the gorillas and their relationship was very tactile. 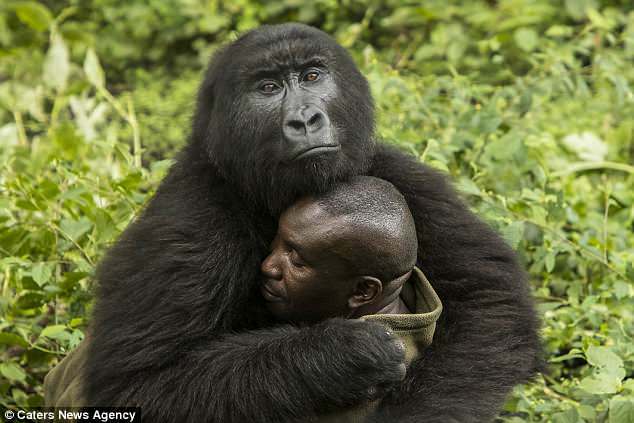 ‘At one stage, one of the gorillas enveloped Andre in a hug. 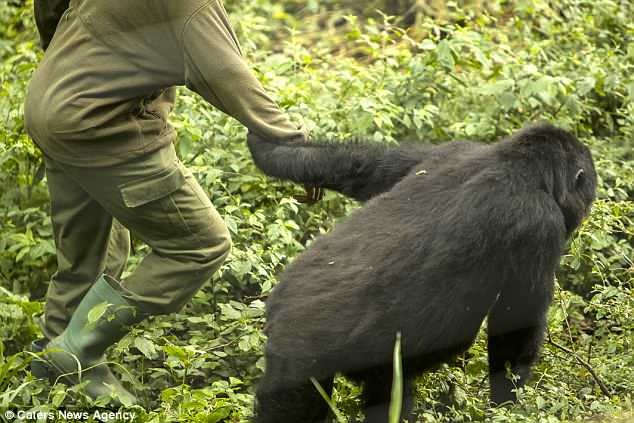 ‘Later, the gorillas signalled it was time for them to return to their sleeping area by jumping on André’s back for a piggy back. The photographs were taken on December 2017 and the gorillas are called, Ndakasi (female), Ndeze (female) and Matabishi (male).